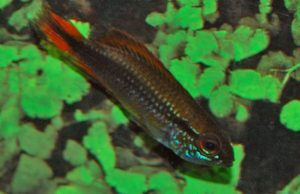 Apistogramma agassizii, also known as Agassiz’s Dwarf Cichlid or Agassizi Apisto, is found throughout most of the Amazon/Solimões basin. The color and patterning of these apistos varies greatly based on where they originate geographically. Color variants include red, gold, and even blue. A. agassizii grows to a maximum length of approximately 3 inches and may be housed in an aquarium as small as 20 gallons if good water quality is maintained. These fish are recommended for intermediate hobbyists as they can be sensitive to nitrates; keeping up with regular water changes and parameter testing is necessary for keeping this species healthy and happy in your aquarium. A. agassizii does best in well-oxygenated, acidic water with a pH range of 4.0 – 6.0. Water temperature should be kept between 73 and 82 degrees Fahrenheit. This species is peaceful when kept with other community species similar in size and non-aggressive (avoid other dwarf cichlid species). Territorial disputes can be minimized by adding lots of plants, driftwood, leaf litter and rocks to break up the line of sight. A. agassizii is omnivorous and should be offered a variety of live, frozen, and prepared food. Feeding multiple, small meals a day will help with maintaining good water quality. Some recommended foods are black worms, frozen blood worms, frozen mysis shrimp, as well as pellet and flake food with some source of vegetable matter (i.e. : algae, spirulina).